Corfu passenger and car ferry ticket prices, timetables, ticket reservations and information for ferries sailing from Corfu to Bari, Brindisi, Igoumenitsa, Patras and Venice. Compare all available Corfu ferry ticket prices in real time and book the cheapest available Corfu car and passenger ferry tickets sailing to and from Corfu, Bari, Brindisi, Igoumenitsa, Patras and Venice with Superfast Ferries, Agoudimos Lines, Endeavor Lines, European Sealines, ANEK Ferry Lines or Minoan Lines ferries online with instant confirmation. Book Corfu Ferry Tickets with Superfast Ferries, Agoudimos Lines, Endeavor Lines, European Sealines, ANEK Ferry Lines or Minoan Lines for ferries sailing from Corfu to Bari, Brindisi, Igoumenitsa, Patras and Venice online in advance to enjoy the cheapest available ferry ticket price. The price you see is the price you pay. There are no hidden extras or surprises such as added fuel surcharges or booking fees and we do not charge you anything extra for paying with a Visa Electron card. The price we quote you for your selected Corfu passenger or car ferry ticket, onboard accommodation and vehicle type is all you will pay, and that's a promise. To obtain a Corfu ferry ticket price and book your ferry ticket securely online please use the real time ferry booking form on the left. You are also able to add a hotel at your destination, or anywhere else, to your ferry ticket when completing your ferry ticket reservation. Corfu, or Kerkyra (ker-kih-rah) in Greek, is the second-largest and the greenest Ionian island. It is also the best known. It was Homer’s ‘beautiful and rich land’, and Odysseus’ last stop on his journey home to Ithaki. Corfu enjoys a mild Mediterranean climate along with excellent beaches making it a popular destination for holiday makers. Corfu is very green compared to other Greek islands: hot and dry summers along with winter rain creates lush vegetation which is dominated by over 2 million olive trees. These olive trees on Corfu are the main cultivation, although Corfu's tourism now provides the most income. With the nation’s highest rainfall, scores of vegetables and herbs thrive here, especially in spring. With its beguiling landscape of wildflowers, and cypress trees rising out of shimmering olive groves, Corfu hangs in there as one of Greece’s most beautiful islands. Sadly, areas are suffering from blatant and unheeded over-development. Corfu is one of the bigger Islands, and covers an area of 592 m? (638sq.km) which roughly converts to 40 miles long (60Km) and 20 miles (30 Km) across at the widest point. The average population is around 107,500, with the coldest months being January/February with an average temp of just 16c and the hottest months being July/August average temp of 28c. Turn your attention inland towards Mount Pantokrator or Pandokratoras (906 m high) which is the island?s highest peak. Corfu is perhaps the best known of all the Greek Islands, it is very popular with the British, who flock there in their droves in the summer months to soak up the sun on fantastic beaches and to swim in the crystal clear warm sea, and by night enjoying a traditional Greek meal then maybe entertained by local Greek dancers or visiting one of the Islands discotheques or disco bars that have sprung up to cater for the tourist. Most of the tourist development has taken place within approximately half to three quarters of an hour away from the Islands airport, leaving the north and south more rural whilst inland tourism has hardly had an impact and you will find many villages still carrying on in the old way of life, where the most common form of transport for the local farmers is still to this day the donkey. In amongst the olive and citrus groves you'll find unspoilt villages bearing all the hallmark's of the island?s past ranging from Hellenic, Roman, Byzantine and Venetian. Corfu is by far the prettiest and greenest Island even in the hottest months of summer. Corfu also known as the Emerald Isle a name inspired by it's green fields that burst into an explosion of springtime colour, with meadows decorated with wild flowers and blossom of all kinds, the Islands landscape is covered with greenery more particularly Olive tree gnarled with age and twisted into weird and wonderful shapes, they cover approximately 35 miles (56Km) of the Island from north to south only interrupted by the odd cluster of cypresses. The sent of oranges and lemons fills the air as they ripen in the sun, many other kinds of fruit trees grow here also including the prickly pear and Kumquats a small bitter / sweet tasting orange, not found anywhere else in Greece, these are preserved and eaten whole or soaked in syrup. As well as liquors, kumquats are made into sweets and marmalades, you will find that many of the tourist shops in Corfu sell Kumquat products one of the more famous shops you will find is located next to the "Achillion Palace". Corfu has it's fair share of vineyards, more so to be found in the south which being more flat, has the most agriculture, the grapes are made into wine and you will find it is for private consumption and the harvest is one of the busiest times in the local calendar. The Islands capital or better known as Corfu Town is well worth visiting, the town itself is made up in two parts Old and New areas of the Town. Old town displays the elegant churches of various religions and the maze of cobbled streets with the old fortress that stands proudly looking over the town. New town holds an abundance of cosmopolitan shops ranging from gold to leather that can satisfy everyone's tastes and shopping demands.The Island in fact enjoys the best of several worlds, beautiful scenery, value for money restaurants and tavernas offering simple and straightforward local cooking, a wide range of accommodation from camp sites to clean simple village rooms to apartments, hotels and luxury villas. Corfu offers numerous beaches on its 136 miles (217Km) of coastline ideal for swimming and snorkelling in the warm crystal sea. The Corfiots themselves are straightforward, fun-loving friendly people with a charm that will affect you when you visit. Corfu has a special kind of magic that possess every visitor when they visit and draws them back time and time again. Best Price Guarantee - We always offer you our lowest available Superfast Ferries, Agoudimos Lines, Endeavor Lines, European Sealines, ANEK Ferry Lines or Minoan Lines passenger and car ferries ticket price to and from Corfu. There are no hidden extras or surprises such as added fuel surcharges or booking fees and we also we do not charge you anything extra for paying with a Visa Electron card. The price we quote for your selected Corfu ferry ticket, onboard accommodation and vehicle type is all you will pay, and that's a promise! In the unlikely event you find the same all inclusive Corfu ferry ticket cheaper in the brochure of any other tour operator we promise that we will do our best to beat that price or offer you the choice of requesting a refund. 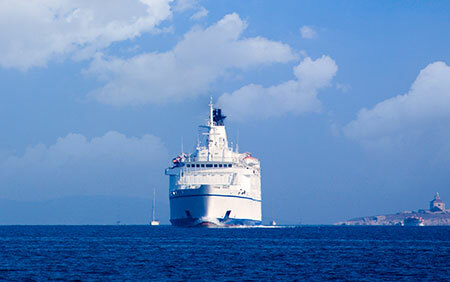 To book Corfu car and passenger ferry tickets please click here. At ferryto.co.uk you are able to obtain live Corfu ferry ticket prices, check availability and book car and passenger ferry tickets to and from Corfu at our lowest available ticket price. Ferryto.co.uk is part of the world's largest online ferry ticket distribution network providing the ability to book over 80 major European ferry operators including to Corfu and to over 1,200 other ferry routes throughout the UK, France, Spain, Ireland, Holland, Eastern Europe, the Mediterranean, the Baltic and North Africa.